w w w. d i v e r i t y w o m a n . c o m S p r i n g 2 0 1 2 D I V E R S I T Y W O M A N 59 MARGARET EGAN General Counsel & Secretary Our purpose—we care for people so they can be their best—is dependent, in part, on inclusion. We identify di- verse talent within the organization and provide them with leadership develop- ment opportunities. I'm an example of that, having been promoted to general counsel from within the company. 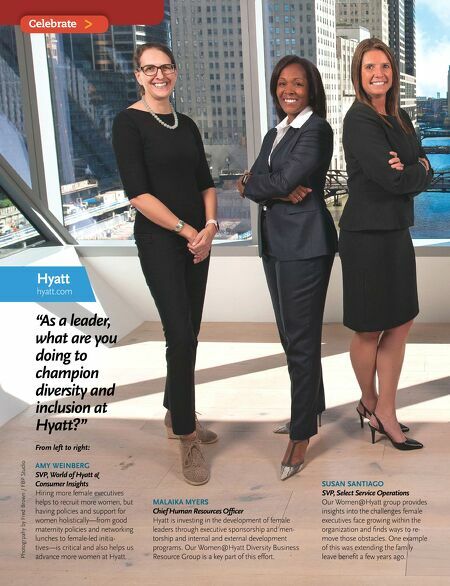 JULIENNE SMITH SVP, Development & Owner Relations I was immediately impressed by Hyatt's focus on expanding our talent from a more diverse and balanced perspective when I joined 13 years ago. We continue to foster an atmo- sphere where connecting with and mentoring one another is encouraged and supported. 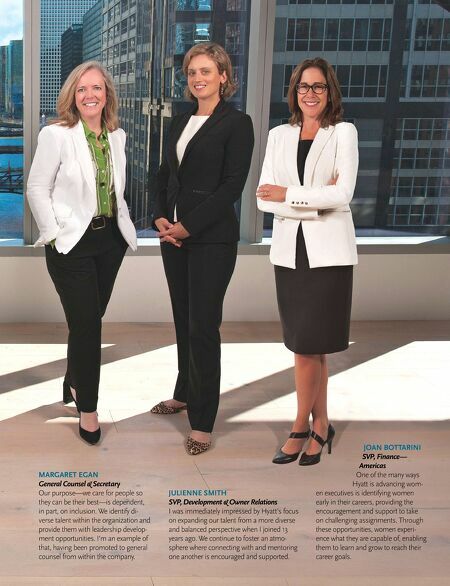 JOAN BOTTARINI SVP, Finance— Americas One of the many ways Hyatt is advancing wom- en executives is identifying women early in their careers, providing the encouragement and support to take on challenging assignments. Through these opportunities, women experi- ence what they are capable of, enabling them to learn and grow to reach their career goals.